Explore the numerous day-trip ideas around Seminyak: Ubud (Sacred Monkey Forest Sanctuary, Elephant Cave Ubud, & more), Green Camp Bali (in Abiansemal) and Sanur (Peek A Boo & Sanur Beach). 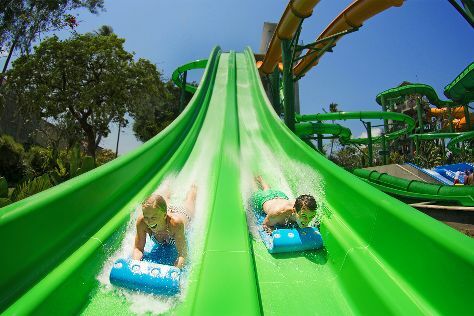 And it doesn't end there: cool off at Waterbom Bali, relax and float downstream with a rafting and tubing tour, kick back and relax at Bingin Beach, and head outdoors with Jimbaran Bay. For where to stay, other places to visit, ratings, and tourist information, read Seminyak day trip planner . Sydney, Australia to Seminyak is an approximately 9-hour combination of flight and bus. Traveling from Sydney to Seminyak, you'll gain 2 hours due to the time zone difference. Prepare for a bit warmer weather when traveling from Sydney in November: high temperatures in Seminyak hover around 37°C and lows are around 29°C. Wrap up your sightseeing on the 13th (Tue) early enough to drive to Amed. Start off your visit on the 14th (Wed): steep yourself in history at USS Liberty Shipwreck, then identify plant and animal life at Wildlife Areas, then savor the flavors at Two Eka Waroeng, and finally don't miss a visit to Lempuyang Temple. On the 15th (Thu), you'll have a packed day of sightseeing: take in nature's colorful creations at Tirta Gangga, kick back and relax at White Sand Beach, and then kick back and relax at Jemeluk Beach. To find maps, traveler tips, reviews, and tourist information, read our Amed tour itinerary planner. Traveling by car from Seminyak to Amed takes 1.5 hours. Alternatively, you can take a bus; or take a bus. In November, plan for daily highs up to 38°C, and evening lows to 28°C. Finish up your sightseeing early on the 15th (Thu) so you can travel to Tegalalang. Start off your visit on the 16th (Fri): pause for some photo ops at Mount Kawi, then contemplate in the serene atmosphere at Tirta Empul Temple, and then identify plant and animal life at Elephant Safari Park. To see reviews, ratings, traveler tips, and more tourist information, you can read our Tegalalang trip planning site . Traveling by car from Amed to Tegalalang takes 2.5 hours. In November, daily temperatures in Tegalalang can reach 37°C, while at night they dip to 29°C. Finish your sightseeing early on the 16th (Fri) so you can travel back home.